Radio is my best friend. I know it is the same for many people. BBC Radio is a particular treasure. Having worked as a press officer in BBC Radio back in the mists of time, I know all too well of the public service mission that the various stations have a duty to deliver, as well as the balancing act they must tread in terms of rising to that challenge, yet still delivering a large enough audience to justify the licence fee. Equally, doing something distinctive, something which the commercial marketplace might not otherwise support is often one of the biggest justifications BBC Radio has for broadcasting a show. The BBC recently announced that it is cutting its flagship BBC Radio 3 show, ‘Late Junction‘ (three nights a week, Tues, Weds, Thurs; 11.00pm-12.30am) to just one slot a week. There is a Guardian piece on the proposal here. Late Junction has become a refuge for me. Sound art; experimental music – a space for artists, musicians and performers to challenge, to experiment, to play, and above all, to provoke. There is no defining it by genre. Late Junction presenter, Verity Sharp. Credit: BBC. At a time when there is a pressure for culture to become more homogensised, and our senses euthanised by the onslaught, this programme provides a space for them to run amok. The BBC should be providing more space for people on the ‘outside’ to flourish – not less. It should be playing to its strengths, and learning from what it does well in terms of public service broadcasting, rather than chasing ratings. I don’t like making easy comparisons, but what Late Junction does on the BBC radio schedules is probably the closest thing we have to what the role was of John Peel on BBC Radio 1. When I was a BBC PR, we had a to develop an ear for any issues which might impair that public service mission, and rupture relationships with our audiences, whether important opinion-former ones, or loyal listeners. This proposal does all three. Late Junction presenter, Nick Luscombe. Credit: BBC. Like many other people, I desperately hope the BBC reconsider this decision. If you have never listened to the show, give it a try, either live on BBC Radio 3, or via BBC Sounds. Regular presenters Verity Sharp, Fiona Talkington, Max Reinhardt and Nick Luscombe are just the most amazing curators of sound. And if you’d like to join the campaign to save this programme, you might like to sign this petition. on Avaaz. There is also a petition on the 38 Degrees site here. Musician and laughter guru, Laraaji, who performed at the End of the Road Festival with Late Junction. Click here for more. Credit: BBC. A range of people including performers, artists, and academics recently signed a letter, urging the BBC to reconsider (“Radio 3 cuts threaten our musical ecosystem”). It includes Alex Kaprons (Musician), Billy Bragg (Singer-Songwriter/Activist), Bob Stanley (Writer/Musician), Brian Eno (Musician), Cleveland Watkiss MBE (Voice Professor, Trinity Laban Conservatoire), Cosey Fanni Tutti (Musician/Artist), Eliza Carthy MBE (Musician), Hannah Peel (Musician/Composer), Ian Rankin (Writer), Jane Besse (Head of Music, Roundhouse), Jarvis Cocker (Musician), Jude Rogers (Music Journalist/Writer), Kathryn Williams (Singer-Songwriter), Nitin Sawhney (Composer/Producer), Peaches (Musician), Peter Gabriel (Musician), Phill Jupitus (Comedian), Polly Eldridge (Co-Director, Sound UK), Rachel Unthank (Musician), Roisin Murphy (Musician), Sorcha Carey (Director, Edinburgh Arts Festival), Stewart Lee (Comedian/Broadcaster/Writer), Tim Burgess (Musician), and Toby Jones (Actor) – and has all the makings of the ultimately successful campaign which was launched when the BBC originally proposed to axe BBC 6Music. Late Junction presenter, Fiona Talkington. Credit: BBC. If the BBC can spend millions of pounds on programmes which could easily support themselves in the commercial sector, surely it can find funding for something which might better help justify its licence fee funding for the longer term. Indeed, it should be doing much more of this kind of programming. I usually think audiences can be too quick to dismiss change, but in this case, the BBC need to pick up on these signals before it loses a connection with what the licence fee is supposed to be about. Late Junction presenter, Max Reinhardt. Credit: BBC. And since it is sound which is what the show is all about, here are ten recent discoveries I have made, thanks to Late Junction. Prepare to be provoked. Such folk female power. I will never forget the night I first heard this track. I had to make sure my Mum was listening too. It still brings a tear to my eye every time I listen to it. This really is what it says it is, from when it says it was – and it is a sheer delight! Spoken word drum and bass about you day job. More, click here. More about this track by the ‘spoken-word artist and saxophonist’, with remix by Hiro Ama of Teleman, click here. This experimental piece immediately reminded me what it sounds like being in a car with both my sister, and her ten year old daughter (and my niece)! Enjoy (I think)! Both the message and the sound stopped me in my tracks with Secret Gardens “where wild flowers blossom… The young are so content, but the old are so bitter… The wildcats are just wandering, just selling and buying, just selling and buying.” More on Farai here. Farai’s Bandcamp site is here. An incredible voice. An incredible track which creates just the right mood for the time I’m usually listening to Late Junction. As the blurb says, “Combo Chimbita returns, expanded and transformed into one of the most original and wild ensembles currently cutting their teeth in the New York City live arena. Their latest 4-track studio effort, EL CORREDOR DEL JAGUAR, co-produced by NYCT’s Greenwood Rhythm Coalition and featuring the powerhouse Carolina Oliveros on lead vocals, is an explosive tour de force of unbridled psychedelic energy and futuristic fire with firm roots in the ritmo of the African diaspora. With connections and inspiration drawn from the vast sea of Caribbean music — specifically the band’s native Colombia — these transplanted first-generation New Yorkers have carved a unique corridor in the thriving underground jungle of the big bad city.” I loved it when Late Junction introduced me to the track. This is Late Junction at its most provoking – the kind of track that I’ve found myself most in need of during recent Brexit shenanigans. I’ve needed to know my senses are still there. In the summer of 2018, I got volunteered together with other local residents in helping to create a neighbourhood plan for our local area – Yateley, Darby Green and Frogmore, in Hampshire. 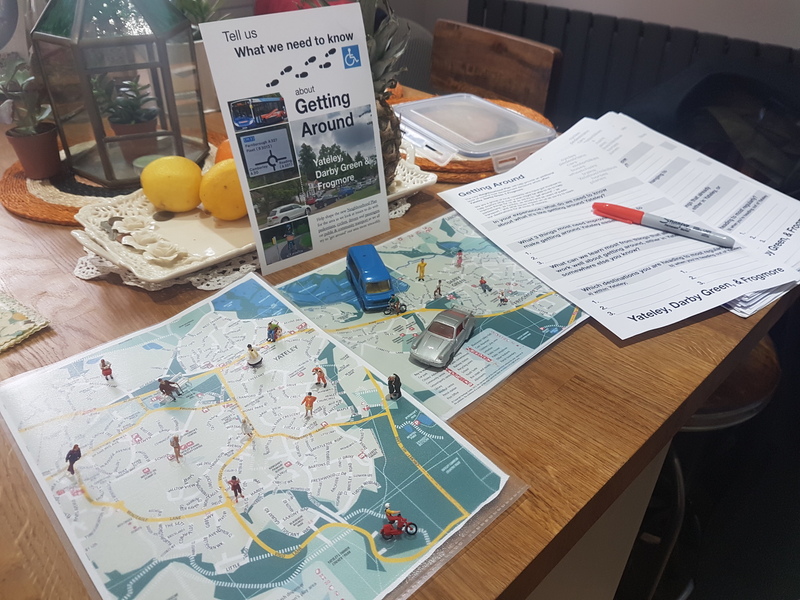 My specific area of interest is ‘Getting Around‘, whether that is transport in all its shapes and sizes, or provision for those of us on the pavements. 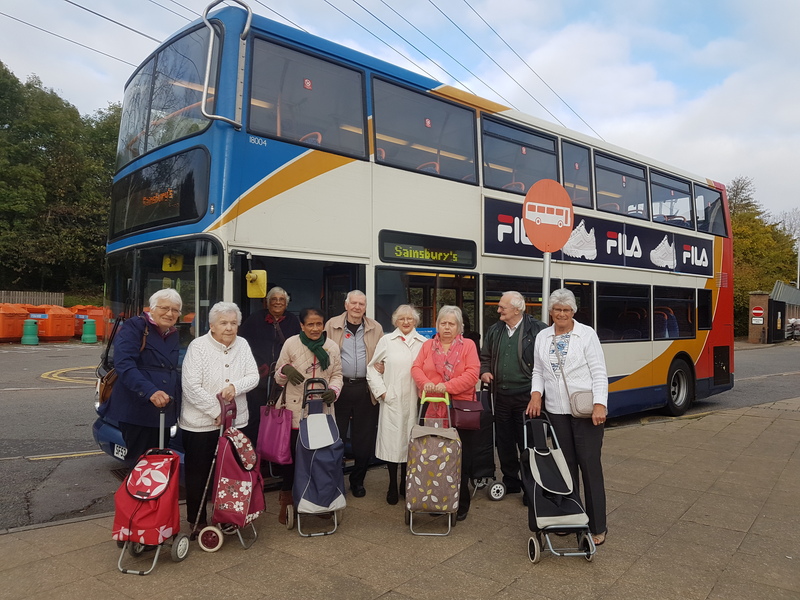 In the course of our deliberations, a number of people have looked longingly at places which have improved connectivity using light rail, trams or guided buses. We were going to look into the subject, hoping to include something of an aspirational nature in our plan, thinking the idea would be a bit ‘Alice in Wonderland‘. Blackwater Station, on the North Downs Line, Hampshire. Imagine our delight when we discovered that we had been beaten to it. There have already been studies in 1991 (about bringing local railway lines and a new interchange hub station with the London Waterloo mainline, as well as additional ‘community stations’ in the Blackwater Valley of which we are a part), and reports in 2002 & 2003 (which make reference to plans for a ‘Mass Transit System‘ for the Blackwater Valley), with the possibility of light rail, trams or guided buses connecting the likes of Aldershot, Farnborough, Camberley, and Bracknell – making the possibility of much better connections with places like Yateley, Fleet, and Farnham with new interchange stations. You can keep up-to-date with the work we are doing on our neighbourhood plan here and the post which contains full details on all of those studies can be found by clicking here. I think it is well worth a read, although I would say that! While these might seem like long term aspirations, hopefully considering the wider strategic context for transport planning of the ‘Blackwater Valley‘, and previous work that has been done in this area for improving connectivity should provide grounds for including aspirations, if not our own specific policies, in our own neighbourhood plan. 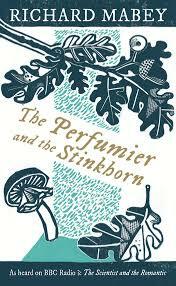 My desire to sniff out ‘the particular’ drew me towards reading “The Perfumier and the Stinkhorn” by Richard Mabey (2011) [London: Profile Books]. It had long been on my ‘books to read’ list after I had discovered one of his previous books, ‘Dreams of the Good Life’ about Flora Thompson – the author behind ‘Lark Rise to Candleford’, who served briefly as village postmistress in my home town, Yateley. As the jacket puts it succinctly, he ‘attempts to marry a Romantic’s view of the natural world with the meticulousness of the scientist. By Romanticism, he refers to the view that nature isn’t a machine to be dissected, but a community of which we, the observers are inextricably part. And that our feelings about that community are a perfectly proper subject for reflection, because they shape our relationship with it.’ Wow! Poetry and science are, in effect, comfortable bed-fellows in a book which is equally respectful to traditional country ways, as it is to the rules of the laboratory. Six elegantly short chapters, illustrated by linocuts, take us through a tour of what the senses might inspire us with on a long walk in the countryside. Early on, Mabey makes the point that while technological advances in devices like cameras on our phones are supposed to enhance our understanding of nature, they can often end up obscuring it by separating us from it in the moment so we don’t full experience it or reflect on it, or forget to see it within a larger frame, so we miss other relationships which it may be a part of, or a wider live experience in that moment which may have involved all of our senses (see #InstaHorror later). 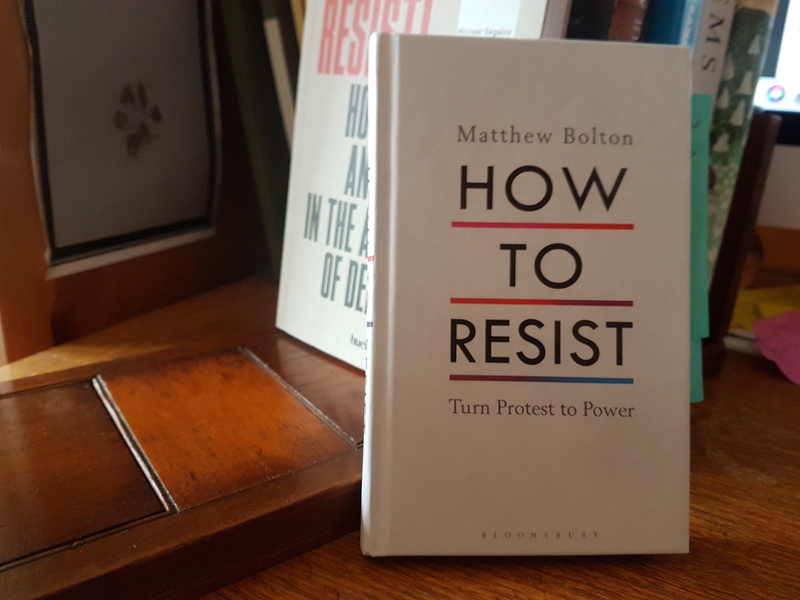 I particularly identified with common experiences documented, like how he described his Dad (and himself) collecting anything that might ‘come in useful one day’ – just like my Grandad’s garage – and learning the lesson from when it did. He returns to example of what now manifest themselves as what we might call #Instahorror making the point that we so often now seem to be looking for the perfect shot for our mantelpiece or social media account that it’s never actually from the perspective that you would see it in-situ in nature itself – and that many people are losing all sense of perspective for their own safety. Not a Stinkhorn, but a Fly Agaric mushroom, which, you’ve guessed it, I’ve seen popping up all over my Instagram feed. Public Domain. 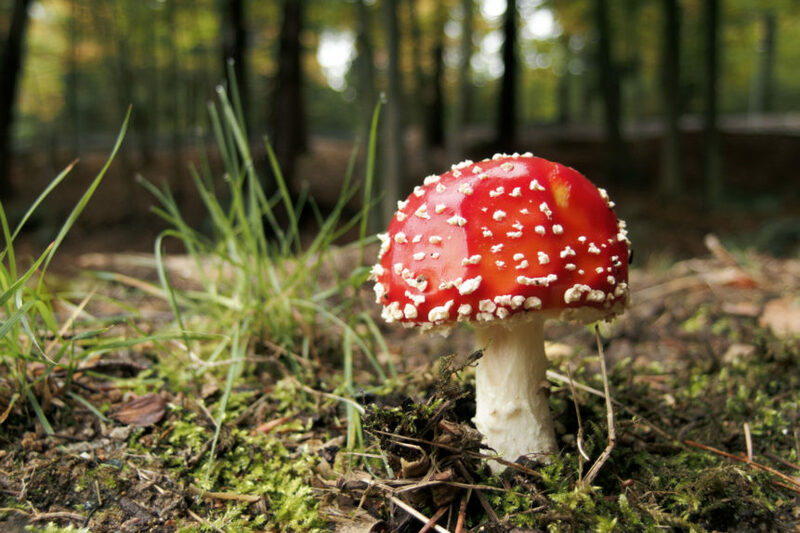 There are some perfect descriptions of ‘particular’ items on his journeys – like samphire – and activities like foraging, and about how the quality of ‘gatheredness’ can make wild food actually taste different. He dwells on taste, and in particular, smell, and their role in fixing our memory in place, moment, feeling, time – indeed, essence. And he goes on to document the quality of ‘petrichor’ (the smell after rain) which I’ve seen documented a fair deal elsewhere of late after a moist end to a particularly dry, hot summer. 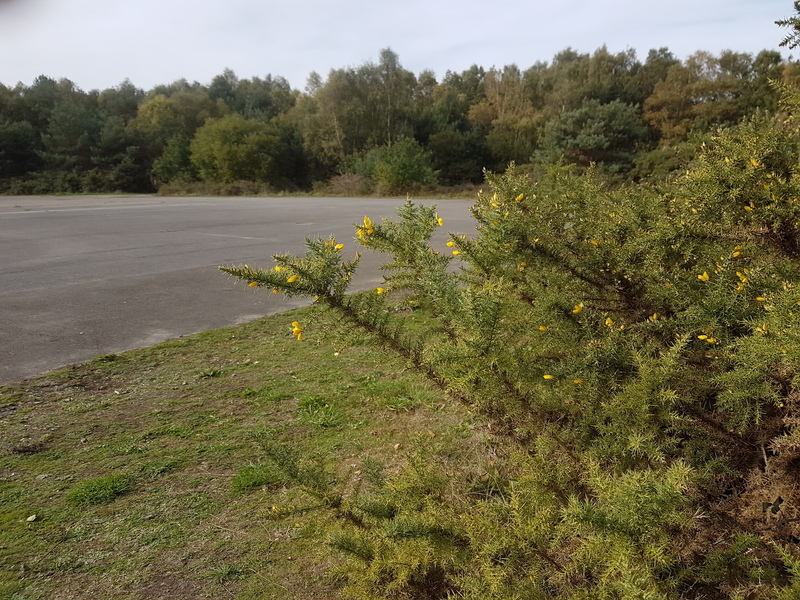 Gorse on Yateley Common, Hampshire, alongside the disused runways of Blackbushe Airport. I was particularly excited when he chose to write about a plant – gorse – very familiar to the common land heaths around the area I grew up in Hampshire, and I remembered a hearing Mabey present a short documentary about its characteristics on BBC Radio 4 in recent years too. Closely associated with ‘courting’ because of the location of the plant on areas of heathland around London such as Richmond Common, and the fact they flower most of the year (hence the famous saying, “When gorse is out of bloom, kissing is out of season“), its distinctive smell of coconut (which it as good as sprays intermittently, as a wonder of nature), and it’s “just right pricklyness” which made it perfect for gypsies over time to hang out washing on to dry (without having to worry about the thorns ripping the material). The final chapter on maps was a dream for me – about our sixth sense (if we have such a thing) – that of ‘direction’, and dwelling on a sense of ‘place’. As someone who loves revelling in old Ordnance Survey maps (but doesn’t quite know why), and thinks they inherited their grandfather lorry driver’s sense of direction (pre-Sat Nav), I loved reading this chapter. The whole book bears testimony to that same relationship I have with the area in Hampshire I live in, which my Mum also grew up in, and her Mum and Dad before her – and generations before them too. The soggy borderlands which Hampshire and Berkshire straddle along the Blackwater River; the flats of heath between Yateley and Elvetham, and the greener pastures towards Dogmersfield, Winchfield and Odiham. A book of delights which makes the point that scientific insight and technological enhancement only powerfully assist our senses when they are guided by our imagination, and crucially, transformed by a special gift we bring to this mix as human beings – that of language. As such, on this last measure, this book certainly delivers. This is one of those books that I am the most glad ever that a friend (in this case, Elisabeth-Madalena) has bought for me as a gift. Not a single strand of disappointment – a huge ‘thank you’, both for this gift, and nature’s gifts too! Radio Mabey: – listen to some of Richard Mabey’s ‘Mabey in the Wild‘ shows on BBC Radio 4 here. Richard Mabey on NPR on ‘Weeds’ – listen here. Richard Mabey on Radio NZ on ‘The Cabaret of Plants’ – listen here. Richard Mabey at the Hay Festival, 1997 – listen here. Audiobook of this title, originally broadcast on BBC Radio, and known as “The Scientist and the Romantic” – click here. As someone with a rare neurological condition (Chiari Malformation, since you ask), I have long had a love affair with Sacks’ interest in the field, and his beautiful way of synthesising material from his professional interest in them, and other material collected along the path of a voraciously curious life lived. His death in 2015 moved me to tears, and I miss him intensely, in the same way there is a hole in my life without the likes of Maya Angelou, Nina Simone, Oliver Postgate and Robin Williams. 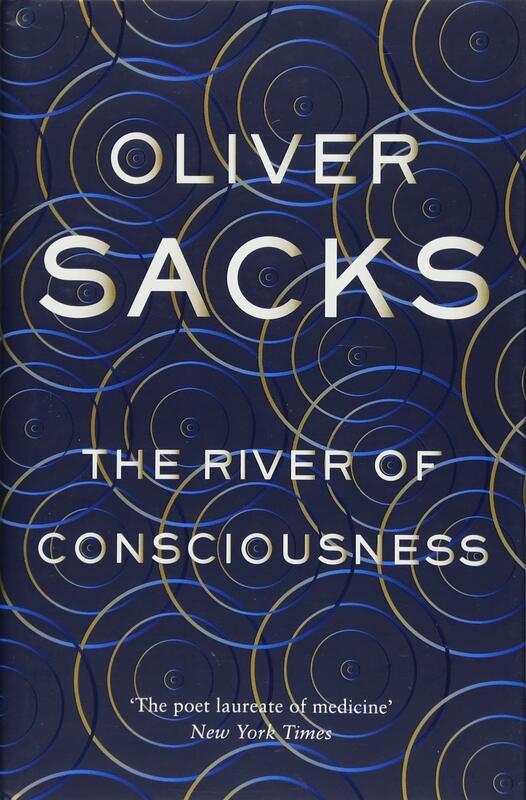 This book (“The River of Consciousness”, by Oliver Sacks, 2017, London: Picador) gives us a chance to spend ‘extra time’ with him following his death – allowing Sacks to spend time dwelling on interests stretching across marine biology; botany; the history of science; quantum physics; philosophy; and of course, neurology. It manages to knit together a collection of what appear at first glance to be unrelated contributions with his trademark hand-holding, and storyteller’s aplomb, to a point where you feel you are at the brink of making a new discovery yourself, by reflecting on all of the areas he has opened up, step-by-step – whether that be issues to do with ‘speed’; or ‘near death experiences’; or ‘plagiarism’; or ‘creativity’; ‘memory’, ‘consciousness’ or the way in which certain discoveries are filed away and forgotten, only to be celebrated again, many years later. He makes it all feel so easy. As Gavin Francis described it in a Guardian review, the book is able to showcase Sacks’s “agility of enthusiasms”. A book that could all too easily be seen as an after-thought, or a publisher’s exercise to collect together Sacks material that happened to be lying around after his death, and package it up as an excuse to make more money, I found this, like all Sacks’ earlier work, a delight to read, and illuminating. As a complete coincidence, I had only just picked up the book at the same time as I had been introduced to the work of philosopher/scientist/theologian/mystic Emmanuel Swedenborg (1688-1772), and discovering too that he had written about neuro-anatomy (effectively discovering CSF – cerebrospinal fluid), and covered a similarly diverse terrain, making connections across it in much the same way, it further provoked my own reflective river of consciousness. Where Sacks brought ferns, Mexico, sexuality, headaches and neurology to my table (all personal obsessions of sorts), Swedenborg is beginning to do the same with hovercraft, spinal fluid, the pituitary gland, charity, tremors, and the concept of an after-life and near-death experiences too – very similar territory at times to Sacks. This posthumous set of writing has only served to fuel my love of Sacks, and his embrace of ‘the particular’ – a belief that the little, taken-for-granted human observations are just as important in helping to develop explanations for why things are as they are, as are the ‘big’ debates. I will leave one final quote to Nicole Krauss, writing in the New York Times, who remarks on one of the most powerful insights I took away from one of the pieces in the book. “The River of Consciousness” is now available in paperback. I don’t know why I took so long to read the hardback that I had left by the side of my bed!